August and early September had cooler days that we’re used to in these parts, which has led to some of the trees deciding it’s time to pack up shop early. As leaves are beginning to fall, we are reminded that autumn is upon us, just as we are when we find school buses have added 5 minutes to our morning commutes. 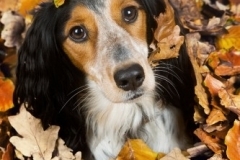 With the new season arrived, as responsible pet owners we must begin to consider the dangers and pitfalls that are associated with and unique to autumn. The fallen leaves, for example, are worth a moment’s thought. By no means do I mean to be alarmist, we all love to play in the beautifully coloured leaves that have tumbled to the ground, although admittedly few love to rake them. Instead, it is a case of what can lie beneath. At home, by following a regular yard maintenance routine and always picking up excrement, you can go a long way to ensuring that a roll in the leaves is just pure unadulterated fun. Monitoring our own backyards, however, is much easier than knowing what is waiting in the park. Depending perhaps on your community, public parks are not necessarily always safe for children and pets to play just anywhere on the ground. When the leaves fall, it’s hard to know exactly what is underneath of them. This is more likely when you’d run the risk of coming across broken glass, unclassified dog droppings and perhaps even in some worst cases, needles. This autumn, play hard but play safe. For more information on how to stay safe outdoors during the fall season, contact your veterinarian today.